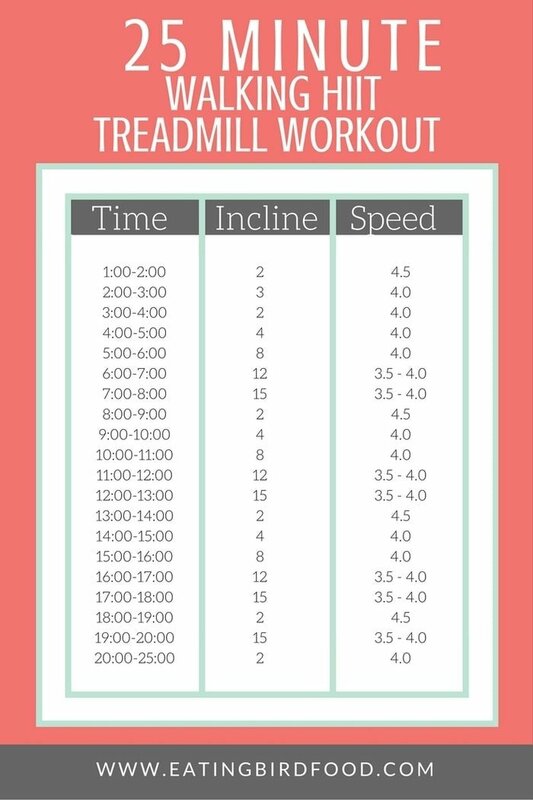 An easy to follow 25 minute walking HIIT treadmill workout that uses hill intervals to really get your heart pumping! I’m back from Canada and basically dying from the humidity here in Richmond. It’s insane. The weather in Winnipeg was so refreshing and totally made me ready for fall. I can’t wait to share more details about my trip soon, but in the meantime I have a quick walking HIIT treadmill workout for you today. Lately I’ve cut way back on my workout routine and have just been doing yoga classes (primarily restorative) and a good bit of walking. Most of my walking takes place outside, but Isaac and I have gone to the gym once or twice over the past two months. <– Which makes me think we should probably just cancel our gym membership, but then what will we do when winter arrives!?! Anyhow, walking on the treadmill reminded me of an awesome walking HIIT workout I posted way back when. The graphic for it was literally a screenshot of an excel spreadsheet so I figured I needed to spruce it up a bit and share it with you all again. The new graphic is much easier to read and way prettier. I think a lot of people don’t consider walking a “hard” or “good” workout, but I beg to differ. 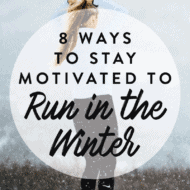 You can totally get your heart rate going and work up a good sweat by walking — especially if you challenge yourself with hills or higher inclines on the treadmill. That’s what this workout is all about! Your speed stays relatively consistent (3.5-4.5 range), but the incline level peaks and lowers so your heart works hard and then gets a break. Hello, interval training!! If you’re going for a true HIIT workout (and into numbers), you’ll want to make sure that during the high incline periods your heart rate is around 80-90% of your estimated max heart rate. 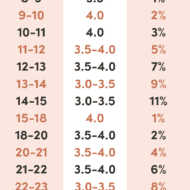 You can easily calculate your estimated max heart rate by subtracting your age from 220. I’m 31 so my estimated max is 189 bpm and my estimated HIIT target range is 151-170. 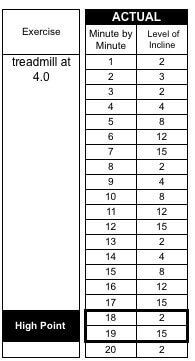 Calculate your target heart rate here. And remember that it’s your workout so you may need to increase or decrease the incline level/speed depending on your fitness level. If you try this workout be sure to let me know what you think. I love getting your feedback. And if you have any workout requests PLEASE let me know. I’m working on a few new workout posts as we speak! I have the hardest time finding a HIIT workout that doesn’t involve a bunch of jumping around or hard impact moves for the joints. I’m definitely going to try this one out soon. Looks challenging and fun! Thanks Brittany! Having a low impact HIIT workout is awesome! I’ve struggled with plantar fasciitis (and I’m paranoid about it coming back), so being able to get my HR up without running is perfect for me. Can we please have Winnipeg weather forever!? This workout looks awesome! Thanks for posting this! I’ve been using the treadmill more lately and really needed a shakeup in my routine. This is perfect! This is awesome! Quick question is the speed in mph or kmh? Thanks!